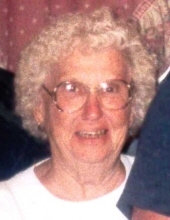 Ruth Idell Henson, age 89, of Verona, Missouri, passed away at 2:14 p.m. on Monday, March 25, 2019, at home, surrounded by her family. She was born March 7, 1930, in Stone County, Missouri, the daughter of Irvin and Rosa (Simms) Daniel. On April 19, 1948, she married the love of her life, Carl Armon Henson, in Aurora, Missouri. The couple raised three sons and spent many happy years together before his passing on December 28, 1989. Ruth was an Inspector for Juvenile Shoe Factory in Aurora and enjoyed cooking, baking and hosting family gatherings at her home. Most importantly, she loved visits from her children and grandchildren. “Granny” Ruth is survived by her two sons, Rick Henson and Hershey Roden, of Verona and Mark Henson and his wife, Belinda, of Pierce City, Missouri; daughter-in-law, Janice Henson of Verona; seven grandchildren; ten great-grandchildren and three great-great grandchildren. Ruth was preceded in death by her parents, Irvin and Rosa, husband, Carl “Stem” Henson, son, Timothy Henson, great-granddaughter, Jolissa Clayton, sister, Ruby Calton, and four brothers, Oral, Ted, Glen and Joe Daniel. A graveside service, under the direction of the Crafton-Cantrell Funeral Home in Aurora will be held at 10:00 a.m. on Thursday, March 28, 2019, at the Calton Cemetery. To send flowers or a remembrance gift to the family of Ruth Idell Henson, please visit our Tribute Store. "Email Address" would like to share the life celebration of Ruth Idell Henson. Click on the "link" to go to share a favorite memory or leave a condolence message for the family.